This utility checks whether a file used with esp file exists. Typically, mod is configured with esp/esm file and resource files such as the scripts / sounds / textures / meshes. If the resource file is missing, mod not work correctly, or the graphics does wrong. With this utility, you will be able to list the missing files. You cannot modify my file and redistribute without my permission. 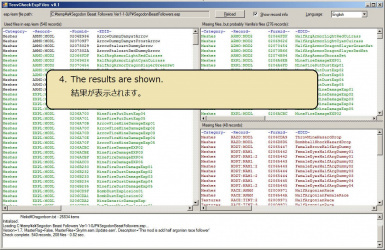 - You can detect Seq files. - Improvement of the detection method of the music file of the MUST records. Regardless of the asset file extension, both of .wav and .wma files are detected. - You can find for the "File not found" rows by pushing the F7/F8 key. - Improvement of the checking method of the BPTD:BPNI/BPTD:NAM4 records. allow to asset path, such as "BASE Meshes\Actors\SabreCat\...". - Improvement of the checking method of the SOUN:FNAM records. When folder name (not a file name) defined, Detect all files in the defined folder. - About dialog does not localized, so fix it. - Improved the User Interface. 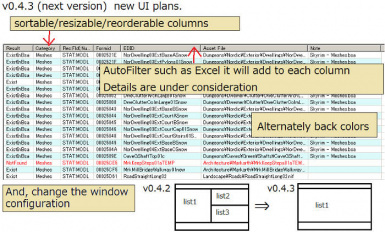 You can filtering rows, sort rows, reorder columns, hide/unhide columns. - Recognize MCM translation text/strings file/ini/bsa/psc files. - Recognize book texts img tags (illustration of books). - You can select plugin's localized language. - You can open multiple plugins. - You can open plugins that installed in Skyrim (According to plugins.txt). - Improved some messages and dialog texts. - Added a function to output to a CSV file by a result. Checkbox has been added to the File List Output dialog. 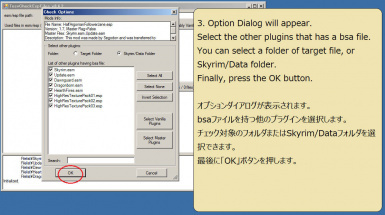 - Adding a Check Option dialog that can be selected to other mods bsa files (in current folder or Skyrim/Data folder). Dialog will appear when you open the esm/esp files. 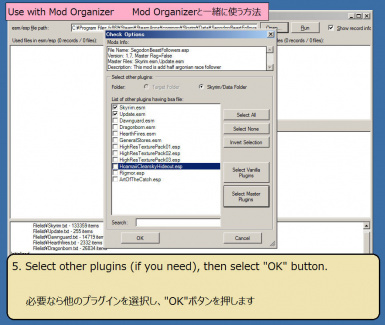 - You can launch this utility from Mod Organizer. 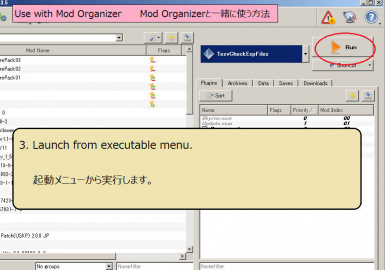 Please register the TesvCheckEspFiles.exe to the executable menu, and launch from executable menu. After that, open the Skyirim\Data\*.esm or *.esp files from the file open dialog (push the "Open..." button!). - When start the utility, It was on to determine the skyrim folders and files (install folder, Skyrim.ini folder, plugins.txt folder, plugins.txt file). After download the skyrim from steam, if once you did not even launch the skyrim, utility will not be able to determine the skyrim folders. Please launch the game once if you get an error. - As a reference, to provide a spreadsheet of the mod file implementation list. It entered in the zip file (OpenOffice ods file and pdf file). - Support Oblivion's bsa (bsa version 0x67). Because some mod seemed to use bsa of an old version. - When chose a file in file open dialog, open mod immediately. - Split Skyrim.txt into Skyrim.txt and Update.txt. - A control code that is included in the asset file name, it was made to convert to "[0xnn]" (nn is hexadecimal code). - Fix the VMAD field of all records was not handled. 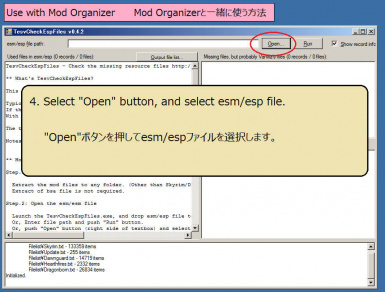 - You can open esm/esp file by textbox or file open dialogue. - Improved processing performance. 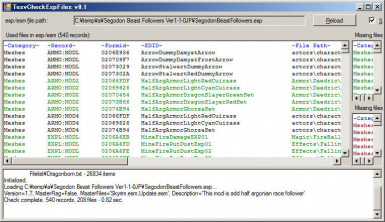 For example, Dragonborn.esm processing speed 130~300sec -> 4sec. - Fix some records have not been processed (ANIO, ARMA, ARTO, CAMS, CLMT, EFSH, GRAS, IDLE, IPCT, LVLN, MATO, MSTT, MUST, SNDR, SOUN, SPGD, STAT, TXST, WTHR). Sound file (.wav/.xwm) should be listed. - Fix Japanese help was English. - You can output file list to text file and clipboard. Typically, mod is configured with esm/esp file and resource files such as the scripts / sounds / textures / meshes. If the resource file is missing, mod not work correctly, or the graphics does wrong. So far, I extract a file path included in esp as much as possible and only make matching with a actual file simply. Please do not fully trust the results of this tool. Should only be kept in mind as reference. In a sad thing, I do not have knowledge of modding. I investigate it every day and intend to expand the program if new knowledge is provided. Potential Database Breach has been announcements from Dark0ne here http://www.nexusmods.com/skyrim/news/12670/? , So just in case, I verified whether my files which uploaded was not modified illegally. As a result, there was not the problem and was the same as the backup copy in my computer. Please don't worry about that. I'm not the modder. I always play mod and translate it. I noticed a certain thing recently, In there being many mod which does not work by the lack of the file. It is what you should grieve that mods does not work by the lack of the file even if you make splendid Mod with much effort. I don't have the experience using the CK, but the format of the esp/esp file was shown in UESP Wiki, I decided to make it because there was knowledge of the programming to me. Currently status is WIP!! This utility is not yet complete. Please be careful about all files which mod uses not being output. This utility UI supports multiple languages, now available English and Japanese. If you copy and translate the two files in the Res folder, it can also correspond to another language. If you do not mind, please send it to me if you make the resource file of a different language. Add your name to the credits, and include the resource file to the utility. This is the first time that I made programs supporting multiple language, Please contact me if you don't seem to work well in Windows of the English version. In the screen shots I used the Segodon Beast Follower by Segodon. I had a lot of useful advice from Segodon. I thank to take this opportunity. For a test of the availability, I used a lot of mod uploaded in nexus. I cannot give the name one by one, but give thanks for all modders. There is a detailed description of English and Japanese below. 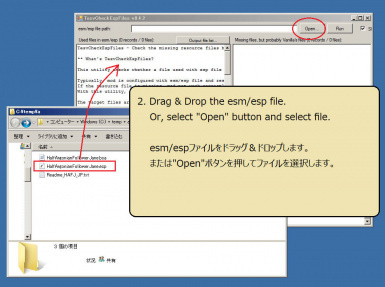 This utility checks whether a file used with esm/esp file exists. Typically, mod is configured with plugin files (esm or esp) and asset files such as the scripts / sounds / textures / meshes. Notes: Currently status is WIP!! This utility is not yet complete. Please be careful about all files which mod uses not being output. 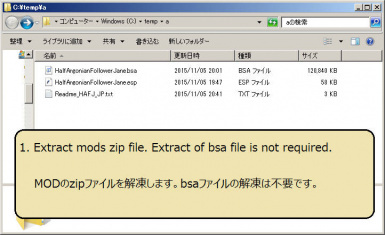 Extract of bsa file is not required. Launch the TesvCheckEspFiles.exe, and drop and drop plugin files (esm or esp) to main window, or select files from the "File - Open" menu. You can open multiple files. "Check Option" window will appear. Select the other plugins that has a bsa file. You can select a folder of target file, or Skyrim/Data folder. As with TES5Edit, check the plugins. Finally, press the OK button. Step.4: Look the result lists. The list of records that an asset file is defined in plugin is displayed. The "Result" columns survey results are displayed as icons. There are four types of icon. As with spreadsheet software such as Microsoft Excel, you can filtering rows, sort rows, reorder columns, hide/unhide columns. Select the "File - Open from Skyrim/Data folder" menu. "Select Plugins" window will appear. Select the plugins, and press the OK button. 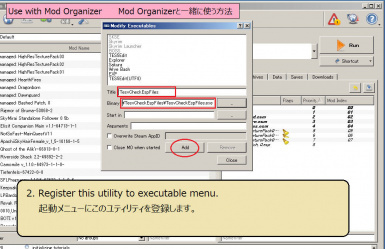 You can launch this utility from Mod Organizer. 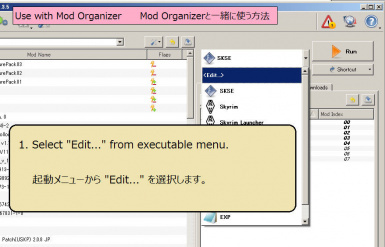 - Please DO NOT install the Mod Organizer's folder! 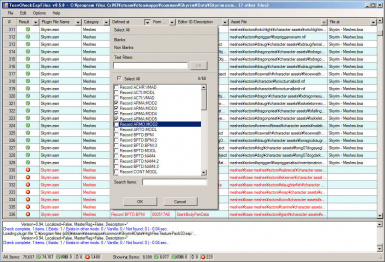 - Register the TesvCheckEspFiles.exe to the executable menu, and launch from executable menu. - After that, Select the "File - Open from Skyrim/Data folder" menu. I don't have a windows XP/8/10. So it doesn't work verification, but perhaps it works well if .NET Framework 4.0 installed. When update from old version, simply overwrite files. Delete the installed files. Registry does not use. I'm not an English native speaker (living in Japan). Improvement suggestion of the sentences is a welcome. Record format is unknown, so not implemented. Under investigation. There is no definition of the file path in esm/esp file. Can't check it for the moment. Probably I think that there are many problems with others. I do not have the experience using the CK, and understand only a range to be able to read from a record definition of plugin. I intend to be improved with every effort if you can offer information. Please feel free to post. - Improvement of the check precision. - Support nif files (analysis of the contents). - Asset file copy feature. Tester/Adviser: Segodon, I had a lot of useful advice from Segodon. I thank to take this opportunity.